LONDON and PARIS – January 28, 2016 – GE (NYSE: GE) and Petrofac (LSE: PFC) today announced a contract worth over £110 Million to engineer, construct and install a turnkey power system to efficiently connect up to 336 megawatts of clean energy from the Galloper Offshore Wind Farm off the coast of Suffolk, U.K., to the British grid. The contract was awarded by Galloper Wind Farm Ltd with the goal of helping meet the UK's ambitious goal of generating 15 percent of the country's electricity from renewable sources by 2020. 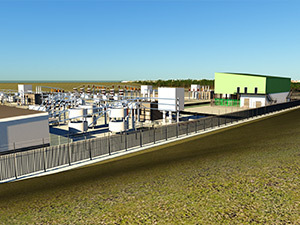 “We are proud to be a part of such a significant project – helping Britain to include more renewable power in its energy mix,” said Neil Beardsmore, North Europe Commercial Solution Leader at GE's Grid Solutions, a division of GE Energy Connections. “The ability to effectively transmit and integrate Galloper's energy to the British grid is essential to bringing efficient and reliable clean energy to UK households." The project is now fully underway. Construction will continue through 2016 with the offshore substation scheduled to be installed in 2017. The wind farm will commence operations in March 2018.